is located on 10 acres, 8km west of Leduc on Highway 39. It’s a family owned and operated business with family values since 1991. Originally we were located east of Camrose where we worked on all kinds of machines and equipment, but specialized in John Deere snowmobiles. Larry, our John Deere snowmobile Guru, has been working on John Deere snowmobiles since the early 1970’s. Center Point moved to our present location in 1997, starting with only the workshop, 2 small offices, and a small parts area. 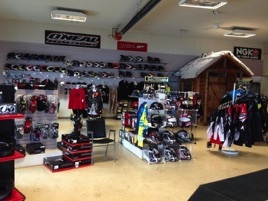 As business grew, a showroom for machines, parts, accessories, and riding gear was added in 2003. We all ride, whether it be ATVs, UTVs, snowmobiles, motorcycles, dirt bikes or personal water crafts. We use the products, accessories, and riding gear we sell, so we are very familiar with it all. Because we take pride in the many services we provide, we make sure that all our customers have the best experience when they bring their machines to us. We offer services for most makes and models of small engines, from lawn mowers to watercraft. If it’s parts you’re after, we’ll point you in the right direction with our well stocked parts department. If you’re looking for something a little “Outside the box”, talk to us about custom modifications. Stop in at Center Point Performance today and experience us for yourself.